Community leader Quanell X, former Councilwoman Jolanda Jones, Bishop James Dixon, and the National Black United Front (NBUF) held a public meeting between Texas Department of Public Safety’s Houston-area commander Phillip Steen and other senior Texas DPS officials, to address the status of the officer who arrested Sandra Bland. The event was held this past Thursday, August 20th, at The Community of Faith Church and was attended by Acres Homes residents and many concerned citizens from the Greater Houston area. Sandra Bland, a community activist and recently hired professor at Prairie View A&M University who advocated for the empowerment of African Americans in her web series, was found dead on July 13 in a Waller County jail after her arrest following a traffic stop for failing to signal when changing lanes, and reported to have hung herself in the most demeaning way – with a “trash bag”. Officer Brian Encina threatened to “light her up” and forced Bland out of her car after she refused to put out the cigarette she was smoking inside of her car during the minor traffic stop. Bland was subsequently slammed to the ground and suffered tremendous physical pain as a result. “If this happens again it won’t be any more peaceful meetings, because our young people won’t stand for this,” said Quanell X. “People are losing hope. I’m about to tell people straight up, we’ve got to fight back,” said Quanell X.
Quanell X’s words echoed the frustrations that many members of the African American community had at the forum, after Steen was unable to provide a timetable for the investigation into officer Brian Encina – whose actions, many believe, led to the eventual death of Bland. “Everybody is entitled to due process,” said Steen. Steen said Encina has been assigned to desk duty pending the outcome of the ongoing criminal investigation into the case and a separate DPS administrative review. When Jones pressed Steen about whether the officer had the right to tell Bland to put out her cigarette, the official stated he “didn’t know the law” but did later acknowledge to a member of NBUF official that the officer did violate a common 7-step procedure. “What I don’t understand is since you are charged with enforcing the law, you get special treatment and you get special training, but still you weren’t able to tell me what the law was,” said Jones. Steen said that it was clear there were issues of basic courtesy from Trooper Encina, but pointed out that any in-house decisions would have to wait. Steen noted the Department of Public Safety is “committed to making sure our troopers exhibit the highest levels of professionalism and courtesy when dealing with the public” but still couldn’t provide a time table for the investigation. 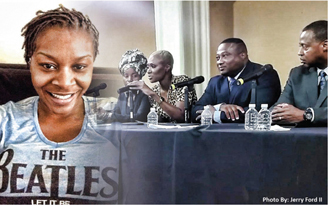 Many community members have refused to accept the narrative about Bland’s suicide, and became even more irate once dash cam video of Bland being pulled over because of a minor traffic violation came to light. “We’re doing all we can to keep Houston from becoming Ferguson,” said Bishop Dixon. With many students starting school this week, this is an African American community that has experienced a plethora of violence and injustice towards them just over the summer break. Starting in early June, the African American community was outraged after witnessing a 14-year-old African American girl in a bikini being thrown around at a pool party like an animal by a police officer in McKinney, Texas. Days later, the community felt despair after Dylann Roof, a 21-year old White man, walked into a historic African American church in South Carolina and carried out a terroristic attack – killing 9 Black people during bible study, including State Senator Clementa Pinckney. Weeks later, in Cincinnati, an officer murdered Sam Dubose in a disturbing body cam video. Then a few days later, a 19-year-old African American football player named Christian Taylor was murdered in Texas after a combination of youthful mistakes and a trigger-happy police officer met up with one another and became the formula for Taylor losing his life. All of these things happened over the summer break for students, which has left many leaders feeling as if they are running out of options and are consistently searching for and demanding justice. Many African Americans are concerned that Officer Encina will not pay the price for what happened to Bland – which could be another blow to an already frustrated community – and the 1977 Supreme Court decision, Pennsylvania v. Mimms, could be the decision that gets Officer Encina off the hook. The 1977 decision has generally been understood to allow officers to order people to exit their car for any reason. This was a decision in 1977 that stated an officer may order a legally detained motorist out of their car at will. The issue in 1977 involved a man named Harry Mimms who was pulled over by Philadelphia police for expired tags. Mimms was ordered out of the car without reason resulting in the officer finding an illegal firearm. Mimms was charged with illegal possession of a concealed firearm, but argued that the gun be excluded from evidence under the Fourth Amendment’s ban of unreasonable searches and seizures. The Pennsylvania Supreme Court agreed, saying the officer needed a reason beyond the traffic violations to force Mimms out of the car. The United States Supreme Court, however, disagreed stating “general concerns about officer safety are enough to justify such an order”. Steen sat next to Quanell X during the meeting and listened to his stern words. “If y’all decide to put him back out in the streets do not send him to Prairie View around our young students,” said Quanell X. “When I was a young boy my grandmother told me if you ever encounter a police officer look down to the ground. Don’t look him in his eye because no matter how we are dehumanized just shut up. Well, this sister was a strong sister and she spoke straight up. My question for you is, what are you going to do about this cop?” asked Quanell X. When pressed about his personal opinion concerning the officer’s action, Steen referred to a parallel situation to justify the officers’ actions, stating that a White man was told to exit his car and asked to put out his cigarette, because the officer stated general concerns about his safety in a previous incident in Waller County. Bishop Dixon challenged officers to stand up to their peers who are doing wrong. However, many in the African American community are asking the question; Does a law make any act right just because it is deemed lawful?